What made me decide to contribute to this volume of essays was a feeling of exclusion, so to speak. 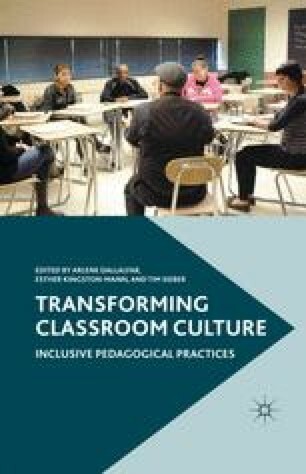 Although the literature on the scholarship of pedagogy and the New England Center for Inclusive Teaching (NECIT) seminars indeed resonate with many of my concerns as a person of foreign origin in American academe, none of the speakers at the local NECIT events or the authors of the literature I surveyed represents my discipline. They come overwhelmingly from English departments, followed by a few historians, sociologists, psychologists, and, more rarely, a scientist. So it seems to me that if exploring difference to recognize common grounds is one of the primary concerns of my teaching and scholarship, then it would only be logical to use my apparent otherness among my colleagues in this enterprise as a productive springboard to locate allies. So drawing on the issues of diversity, multiculturalism, and racism in the classroom and in the institutional setting, in this chapter, I examine my discipline’s idiosyncrasies that determine its position within academe, its role in an art school setting, its effectiveness as a tool to engage in discussions of social inequities, and my position in the classroom as a male teacher of color representing this discipline. I see this exercise as a form of self-reflection, even as a self-critique at times.